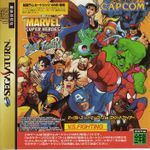 Marvel Super Heroes vs. Street Fighter (マーヴル・スーパーヒーローズ VS. ストリートファイター) is the fourth Marvel Comics-licensed fighting game produced by Capcom (see Marvel vs. Capcom series). It is a sequel to X-Men vs. Street Fighter which replaces most of the X-Men characters with characters from Marvel Super Heroes. In an attempt to balance the previous games' problems, the game engine was altered, although it remained aesthetically the same. The game was released for the arcade in 1997, Sega Saturn in 1998 and Sony PlayStation in 1999. The game uses the same tag-team format previously employed in X-Men vs. Street Fighter. In addition to all the features introduced, the player can now summon their partner to perform one of their special moves without changing their currently-controlled character.